I post this mainly because I find it amusing and it fits in with what we do here, but also because any excuse to watch this video again is good enough for me. It’s always nice to hear stories of people with disabilities getting into new fields and breaking new ground. Well, maybe not always. The Chevron clerk told police that 22-year old John Christopher Champion, who was wearing a Gators hat and Gators sweatshirt, had been going in and out of the store for several hours in his motorized wheelchair. Just before 10 p.m., the clerk said Champion piloted his chair behind the counter and demanded cash from the register as he brandished a pocket knife. The 54-year old clerk said she fought back and in her struggle with Champion she stabbed him three times in the leg before he overpowered her. 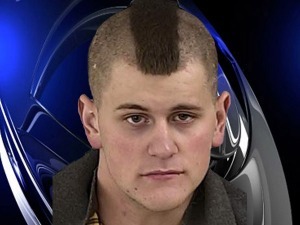 He then allegedly rolled out of the store with a 12-pack of beer and a roll of electrical tape. but he didn’t get far. When police arrived, they didn’t have to look too hard to find him. They caught up with him behind the store, where his wheelchair had gotten stuck in the sand. He was drinking one of the Bud Light Limes he admitted to taking in the heist. Interestingly, he admitted to stealing from the store, but not robbing it. Not sure how that one’s going to hold up in court. Champion also told police that he had encouraged the clerk to hit the alarm because nobody would arrest a handicapped person. He now has armed robbery and aggravated battery charges plus a stay in the Levy County jail that say different.